Vanuatu’s newest 5 star resort is peaceful, private, romantic and secluded. Tamanu On The Beach allows you to take a breath and unwind, coupled with the sand between your toes and the waves at your doorstep. Tamanu is perfect for romance and weddings or just to do nothing. 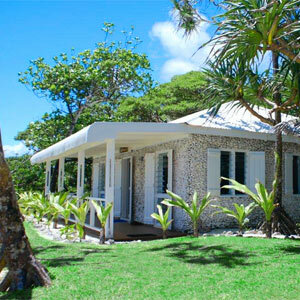 Vanuatu’s newest 5 star family resort is peaceful, private, romantic and secluded. Tamanu on the Beach is located on its own private white sand beach, where you feel a million miles away from reality but just 20 mins from downtown Port Vila. Tamanu just lets you take a breath and unwind with the sand between your toes and the waves at your doorstep. 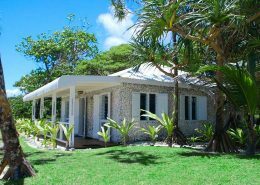 Tamanu is perfect for romance and weddings or just to do nothing and relax in the modern french Caribbean style villas that offer every luxury you need. You have the choice of two bedrooms, dual bathroom villas and plunge pool villas all metres from the beach. 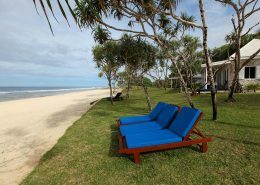 Beachview Villas are just a few metres back from the sand, these villas have views over the blue waters of the Pacific. Coral open air bathrooms and cooling sea breezes give rooms a tropical plantation feel. Original Coral Beachfront Villas with open air bathroom set just metre’s from the water’s edge. Villas are built of coral taken right from the beach in front of you. Watch the sunset over the water from your private deck and then fall asleep to the sound of the waves. 2 Bedroom Plunge Pool Villas are set metres from the beach with ocean views with your own private plunge pool perfect for two couples or a family. Each Villa has two large air conditioned bedrooms with their own bathrooms. The master bathroom has a large bath to soak in and enjoy the view. 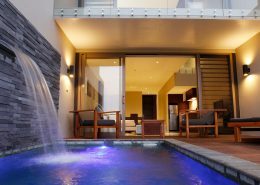 Set just meter’s back from the beach in our lush tropical gardens, these enjoy an amazing vista of the ocean from the verandah and extra-large plunge pool. Villas are spacious and well-appointed and nothing has been spared in their attention to detail with wifi, flat screen TV’s and in-house movies. These villas have a maximum capacity of 6. A beautiful location off the beaten track with 5 star accommodation, professional service, very friendly team and just a pleasure to stay at this quality establishment for 5 nights. We stayed in a 2 bedroom villa with plunge pool. It was set back one row from the beach but we did have an ocean view. *Terms & conditions apply: Valid for travel 01 April 2019 to 31 March 2020. High season surcharges apply. Sale to 30 April 2019. Prices shown are a guide only, based on low season availability & subject to change. Price per adult, twin share based on Air Vanuatu sale fare, valid for new bookings only. Other conditions may apply.